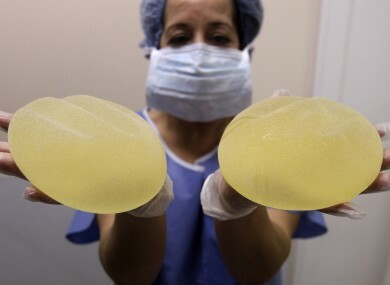 A nurse holds defective breast implant manufactured by French company Poly Implant Prothese (PIP), which were removed from a patient by a plastic surgeon. A FRENCH COURT has ordered German safety certifier TUV to pay €60 million ($64 million) in compensation to 20,000 women who received defective breast implants that the group had approved. The German company was ordered to make a provisional payment of €3,000 to each plaintiff for certifying that implants made by French firm Poly Implant Prothese (PIP) met safety standards. In what became a major health scandal, the devices were later found to contain substandard, industrial-grade silicone gel. “The final amount will be determined after an assessment, but (TUV) is required to make a provisional payment of €3,000″ per person, said lawyer Laurent Gaudon, representing 7,000 women. TUV said it would appeal the latest ruling, issued by a commercial court in the southern port of Toulon. TUV was found liable in 2013 in a first case brought by 1,700 PIP implant recipients and a group of distributors. A number of Irish women have taken cases in Ireland against PIP. Three Irish clinics implant women with the PIP implants: Harley Medical Group, which dealt with 1,100 women; Clane Hospital Cosmetic Surgery which dealt with 250 women; and Shandon St Hospital which dealt with 100 women. In 2012, the Department of Health said it would cover removal costs for the women that attended the Harley Medical Group. The other two clinics provided “satisfactory packages” after being told to cover the cost of surgery for the affected women. When the Irish Medical Board heard about the issues with the implants, it contacted all the clinics that used the product and asked them cease using it. In 2013, MEPs agreed on legislation for stricter monitoring and certification procedures for medical devices such as breast or hip implants, in the wake of the PIP scandal. The proposed legislation seeks to improve transparency of information for patients and medical staff and to strengthen traceability rules, without creating additional burdens for innovative small manufacturers. Email “Faulty breast implants lead to €60 million payout to 20,000 women”. Feedback on “Faulty breast implants lead to €60 million payout to 20,000 women”.